(Bloomberg) -- Texas Instruments Inc., the biggest maker of analog semiconductors, gave a sales forecast for the current quarter that suggests demand for electronics is cooling as the economy weakens amid a trade war between China and the U.S. First-quarter profit will be $1.03 a share to $1.21 a share on revenue of $3.34 billion to $3.62 billion, the Dallas-based company said Wednesday in a statement. On average, analysts predicted earnings of $1.21 a share and sales of $3.6 billion, according to data compiled by Bloomberg. 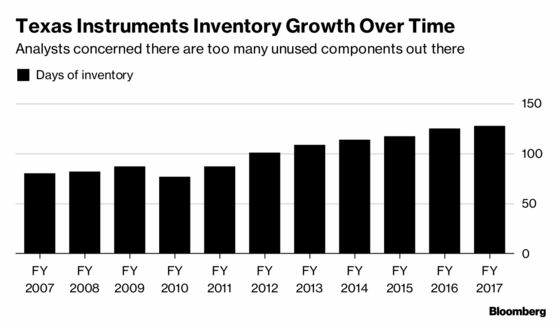 When companies like Texas Instruments report results, analysts and investors look for any accumulation of unsold parts as an indicator of the confidence of customers. Inventory sitting around for months can depress selling prices and if there’s a rebound in demand it delays how that flows into new profits. The company’s analog chips perform the fundamental task of translating real-world inputs, like sounds and touch, into electronic signals. Unlike Intel Corp. and Qualcomm Inc., Texas Instruments’ semiconductors don’t cost tens of millions of dollars to develop and aren’t typically at risk of becoming obsolete quickly. That means the company is less vulnerable to sudden swings in demand or competitive pressure. The world’s sixth-largest chipmaker reported fourth-quarter net income of $1.24 billion, or $1.27 per share, compared with $344 million, or 34 cents a share, in the same period a year earlier. Revenue fell about 1 percent to $3.72 billion. Analysts had estimated a profit of $1.23 a share on sales of $3.75 billion. The company reported its first year-over-year revenue decline since the first quarter of 2016.